Adidas Sereno 14 tracksuit is a 2-piece set consisting of matching jacket and tracksuit bottoms, both made of 100% polyester. This tracksuit is ideal for training or leisure wear for you or for your entire team! The jacket features a full-length zip ending in a soft raised collar and elasticated cuffs on the arms and around the waist. The tracksuit bottoms have an elasticated waistband with drawstring and a classic straight cut. The jacket and tracksuit bottoms also have practical zipped side pockets so that you can securely keep the things you need handy. The tracksuit is made of leightweight, breathable material to give you optimum comfort and maximum freedom of movement. Perfect for warming up, training or lounging around in! 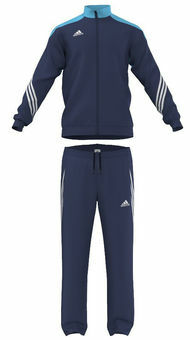 So why not get yourself - or even better your whole team - the adidas Sereno 14 tracksuit today!